The race is now full. There will be no entries taken on the day. Race Registration opens at 09.30am and is located next to the lake in Saltwell Park. Can all runners please collect their number by 11.00 am. I have always wanted to do a fell race, so when I got the chance to do one I took it. The week leading up to the fell race I was so nervous and kept thinking, what if I can’t do it? What if I get lost on the fells on my own?! When the day of the race came I was my usual nervous self. Loads of nervous poos. It was then time to get picked up by Naz and to go and meet the rest of the hoops who were doing the fell race. Naz, Joe and I were in one car and Dom, Phil James and Lois were in the elite car. When we arrived at the start area, which was a car park on a hill in the middle of no where, you could see was massive hills. This is when I started thinking “Is this really a good idea” After we registered for the race, it was back to the cars to get the kit that we had to have to do the fell race. Mine was supplied by my good mate Rob Masson. It was getting close the start of the race so I made my way up to the start where Dom, Phil and Lois were waiting. After a few hugs and good luck handshakes we were off. I looked back to see where Naz and Joe were but I couldn’t see them. Yet again some of the Saltwell men had missed the start of a race! The first part of the race was downhill which I thought was great. 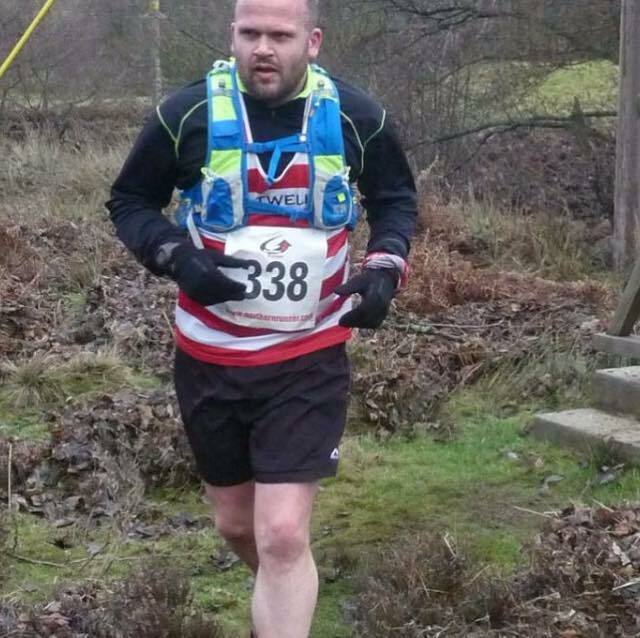 I got a bit carried away on this bit and I was running faster than I wanted to at the start of a fell race. Then we came to the first climb. It was steep and I had to grab on to what I could to get myself up the hill. Including the lady in front of me. When I got to he top of the hill my lungs were burning so I slowed down a bit and ended being caught by the tail runner. I told Lois to run on as I didn’t want to slow her down. My plan was to keep Lois in sight. As I was making my way up the fell the tail runner pointed out two things to me which showed how slow I was. The first was that the lead runner was on the other fell miles ahead of me on his way back to the finish and I was aiming for the trees in the distance. Every time I thought I was making up ground on Lois I either fell over or got stuck in a bog. It seemed that every path I decided to take was the wrong one. I eventually got to the trees and then it was a down hill track to the first check point next to a farm. The check point was two mountain rescue members. As we all know when you have a down hill bit there is normally an up hill and this was it it was so steep (maybe not for some) that I had to push down on my knees to get up the hill. As I ran along the fell through mud, puddles and hurdling rocks I was starting to enjoy myself. Then I made my first fell running mistake in not watching where I was going and ended up going over on my ankle. So I ran and limped in pain for a bit. The tail runner was great trying to keep me going by saying “just run it off”. So that is what I did. Then the fun bit came when I tried to run down a hill that was covered in heather and I couldn’t see where I was putting my feet. Yes you have guessed it. I went head over heals on the heather and bounced down the hill. Once at the bottom, I had to run along the beck where I was ankle deep in cold water. The next check point came and I was struggling and in pain. The mountain rescue bloke asked if I wanted to give up. I won’t lie to you it did cross my mind but I wasn’t coming all this way to give up. I have done that before and hated it. So I limped up this steep tarmac hill and kept going. With the tail runner at myside helping me go the correct way I eventually came to what was the first climb that I have now got to run down. When I say run down I seem to of made my way down most of it on my bum. Then it was the bit I was dreading the last climb to the finish. I thought I was running but I wasn’t as the tail runner was walking faster than me. At this point my ankle was hurting, my lungs were burning and I felt like I was going to be sick. I eventually crossed the finish line last. I had done it. 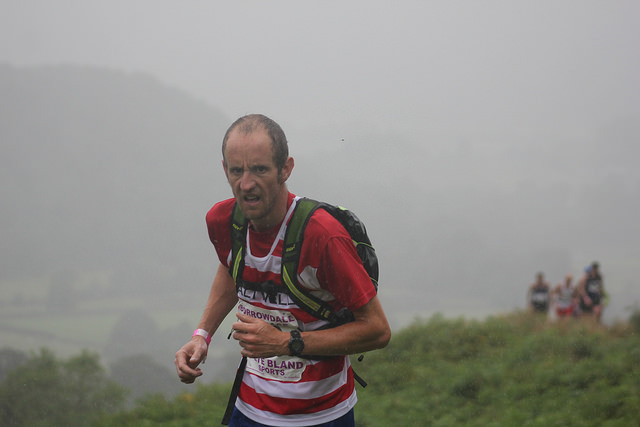 I had done my first fell race. Will it be my last? Hell no! I have a time to beat. Then it was time to get warm in a country pub next to a fire with a drink and some chips. If anyone is thinking of doing a fell race I would say do it but it is hard work but so rewarding when you have finished and you run in some beautiful places.